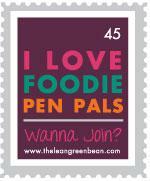 Quick Foodie Penpals tutorial: Lindsay over at The Lean Green Bean runs it every month. You have to opt in each month so you choose how often to participate. You get sent a name and email address, contact that person for their address and other information (special diet, allergies, etc.) and then mail them a food package. The person who sends you a package is a totally different person. I haven’t done a Foodie Penpals in a while. OK, a year, whatever. Here’s the problem. I really enjoy shopping for other people. I put a lot of thought into it and get pleasure out of it. Unfortunately, I usually get carried away and then still have to pay for mailing. But I haven’t done it in a while so I thought I’d give it another go. I was matched up to mail to Maya, who blogs at Chumpkin Butter. I like doing theme packages but ran out of time, so I send Maya some of my favorite things. Check out her blog* to see what I sent her. I received a package from Shelly. Shelly sent me foods that are manufactured close to where she lives. It wasn’t exactly a healthy foods package, but it was really thoughtful. I enjoyed seeing the companies close to her and reading her card about each one. Dying to know what I got, right? a cinnamon mix (P.S., this smelled incredible. As soon as I opened the box, it took over and the whole kitchen smelled yummy! 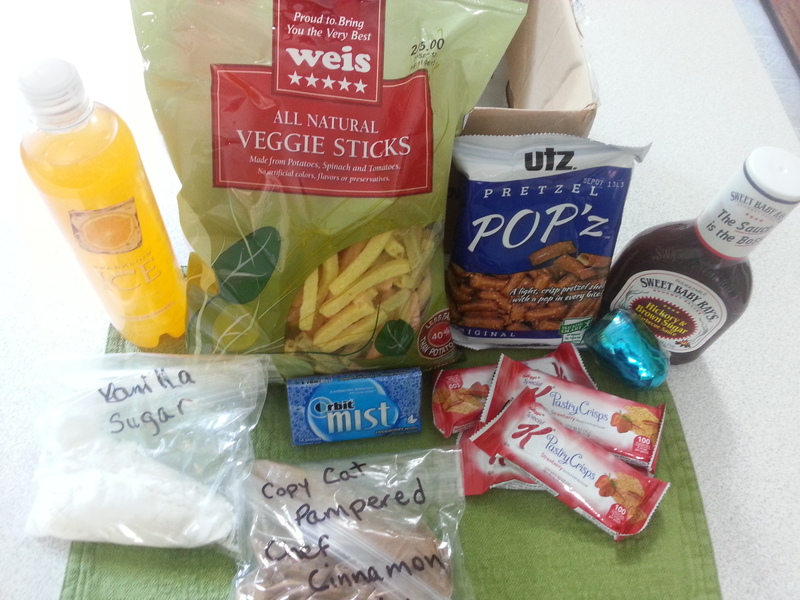 * This is, of course, dependent on her blogging about her Foodie Penpal experience.